SPX futures appear to have visited Shot-term support at 2833.27 this morning, but haven’t put up a challenge, yet. The sideways consolidation is over without making a new high. 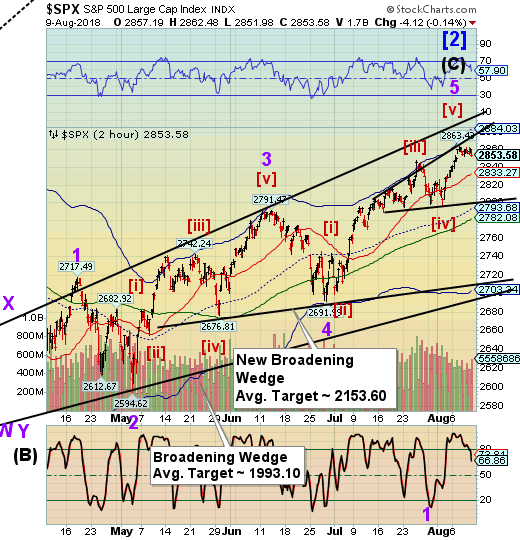 Now we must establish that a new downtrend has taken hold. 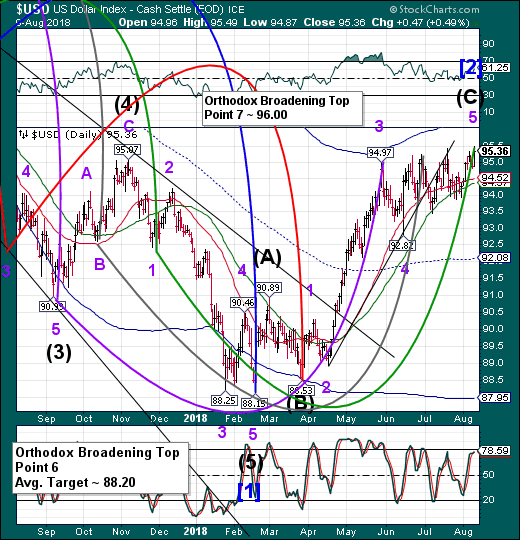 All the Cyclical indicators say that the rally is over. ZeroHedge reports, “For once it's not about trade wars... but the alternative is hardly better. NDX made a final probe higher yesterday, but still short of the all-time high. This morning’s futures sell-off puts to rest the idea of a new high, at least for now. 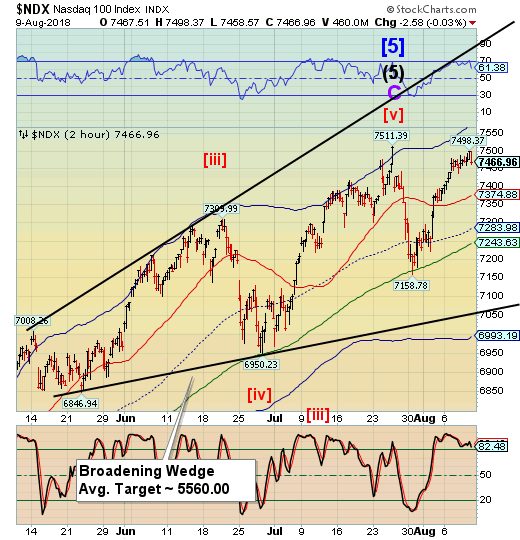 The reason I say that is because NDX is still in a powerful uptrend, from many different perspectives. People still want to own the FAANGS. It may take the puncturing of the lower trendline of the Broadening Wedge to begin to discourage investors who are programmed to buy the dip. This is frustrating many professionals who have been made to look stupid by this market. ZeroHedge observes, "Don't ask me what you should figure out yourself," is the blunt message from former fund manager and FX trader Richard Breslow this morning. VIX futures are climbing in a classic reversal out of a Master Cycle low. 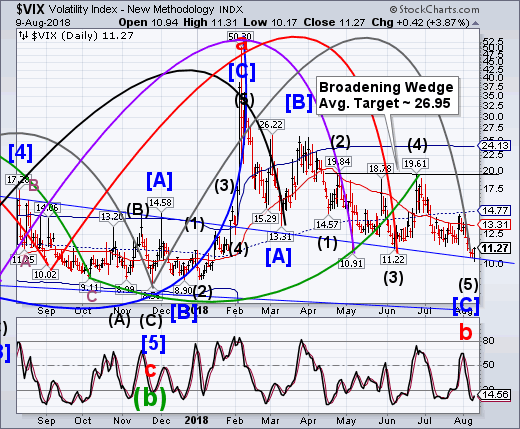 No one appears to be paying attention, since the big play is to be short the VIX. The shorts are starting to feel the pain with the biggest move in the VIX in two months. The Commitment of Traders tells us that both large and small speculators are short the VIX with 109,595 contracts as of July 30 with the commercials on the other side of the trade. This is not a timing tool, since the reports are delayed, but it can tell us which way the wind is blowing. 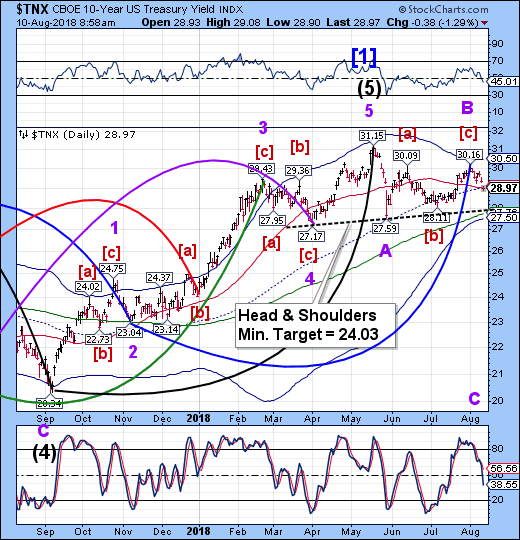 TNX has plunged beneath the mid-Cycle support at 29.00, creating a sell signal for TNX. This tells us that liquidity is favoring treasuries. The most likely source is the proceeds from the stock sell-off. Yesterday ZeroHedge wrote, “After a poor 3 Year auction on Tuesday, a strong, and record-sized, 10 Year auction yesterday, at 1pm the US Treasury sold $18 billion in 30 Year bonds at a yield of 3.090%, 0.3bps above the When Issued 3.087% - this was the 3rd consecutive 30Y tail - and higher than July's 2.954% if below the May and April equal highs of 3.13%. The auction was mediocre with the Bid to Cover sliding from 2.337 last month to 2.274, below the 6 auction average of 2.357 and the lowest since February's 2.257. USD futures hit a new high of 96.03, putting a lock on the “point 7” target. Today shows the most strength in the Cycles Model, but the turn may not come until Monday. (Reuters) - The euro sank to its lowest levels in more than a year on Friday after a report that the European Central Bank (ECB) was growing concerned about the exposure of banks to a dramatic slide in the Turkish lira. The plummeting lira, caused by a deepening rift with the United States and worries about Turkey’s economy, has sent ripples across markets. Nervous investors jumped into the safe-haven dollar, yen, and Swiss franc and dumped riskier currencies like those in emerging markets. The euro was hit hard after the Financial Times reported on Friday, citing two sources, that the ECB had concerns about banks in Spain, Italy and France and their exposure to Turkey’s woes. Banks won’t be exempt from the sell-off. Yesterday happened to be the last day of Cyclical strength for BKX…and a Master Cycle high. This sets up BKX for its next Master Cycle low in mid-September. 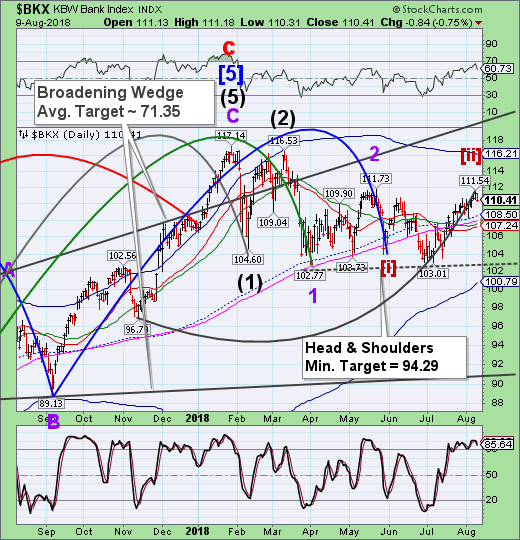 The EW pattern appears to give us the “wind-up” for a mighty decline during that period. Bloomberg opines, “In the decade since the collapse of Lehman Brothers, regulators around the world have taken steps which, they argue, have greatly strengthened the resilience of the financial system. Buoyant asset prices and rising bank shares suggest that investors largely believe them. Unfortunately, the effectiveness of these measures remains uncertain. That will only become clear in a real downturn, rather than a simulated stress test.